The somewhat North American traditional spooky day of costumes, tricks and treats — is gaining popularity in Italy. Carved pumpkins, costumed kids running through the piazzas and posters for Halloween parties at local restaurants or clubs, can be seen in cities throughout Italy. The celebrations are so prevalent, it’s fair to say Halloween has been embraced by Italian culture. In Rome there are Halloween tours of creepy catacombs lined with mummies and bones. In Bologna, you can visit medieval castles and towers during special evening tours. From the end of October through early November, Venice hosts Spettacoli di Mistero or Shows of Mystery, special plays and performances based on the legends and mysteries of Venice. The charming medieval town of Corinaldo, in the Marche region of Italy, is also known as the “Halloween capital of Italy”. La Notte delle Streghe, or the Night of the Witches, takes place here each year on October 31st. The festival boasts music, dancing, and the Miss Strega or Miss Witch competition – a witch themed fashion and talent show. The town center is festively decorated and there are fireworks at midnight. Two important religious holidays fall just after Halloween in Italy. November 1st, is Tutti I Santi or All Saints Day, whereby all saints and martyrs are honored for their service to the Catholic Church. Unlike Halloween, this is a national holiday in Italy. Businesses are closed. and families attend mass together. It is known as quiet day of reflection. On November 2, Tutti i Morti, or All Souls Day, the faithful remember all family and loved ones who have passed away. Cemeteries are often crowded with locals who clean up and refresh the graves of their dearly departed. Traditionally, Halloween, or All Hallows’ Eve, was just the beginning of the celebrations of All Saints’ Day and All Souls’ Day. 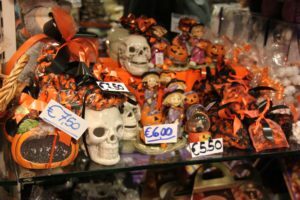 While these are still the main holidays recognized in Italy, Halloween is certainly gaining in popularity. For many Italians it’s just another day to celebrate and have a party. Italian children can be seen walking from store to store through towns asking, “Dolcetto o scherzetto?” – Trick or treat?